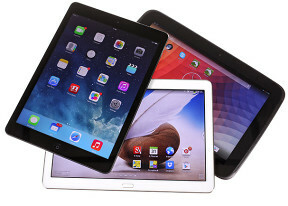 If you must have the best, full-size tablets is where it's at. With 10-inch and higher display sizes, you'll have plenty of screen estate for enjoying multimedia content. If you're going this big then display fidelity plays a much bigger part, so we'll only be listing tablets with eye-popping pixel density in our full-size recommendations. Up next is another offering from Archos, this time in the 9.7-inch flavor. The Archos 97b Platinum HD features a very respectable 2048 x 1536px screen, which is the same diagonal and aspect ratio of the new Apple iPad Air. There is all metal on the back. You'll find a decent 1.6GHz quad-core Rockchip RK3188 (Cortex-A9) processor and 2GB of RAM. Performance-wise, this chipset puts out 17251 at AnTuTu, so it's in roughly the same ballpark as the Samsung Galaxy S3 and the Google Nexus 4, both of which have to cater for less than a third of the Archos 97b Platinum HD number of screen pixels. Unfortunately, with this tablet you'll have to rely on an extra microSD card to build on the very limited 8GB of internal memory. But you'll have more than enough money left over, as the 97b Platinum is still more affordable than most competitors' 8-inch offerings. Then, there are the German only brands Odys (their Odys Iron tablet), Captiva (their Captiva Pad 9.7 Super FHD and Captiva Pad 10.1 Quad FHD tablets), Xoro and Blaupunkt (their Endeavour 1010 tablet). There is also the Chinese Onda V972 tablet, which is an identical twin of the Blaupunkt Endeavour 1010. These have pretty close specs to the Archos tablet with slightly different external design. Unfortunately, none of these tablet makers (or rather sellers) can be considered major per se, so getting into details about those would be crossing a line we promised we won't cross. Asus makes it to our Wi-Fi-only list with its affordable yet capable Memo Pad FHD10 tablet. At 1920 x 1200 pixels, the 10-inch IPS LCD display provides great sharpness and wide viewing angles. Although the dual-core 1.6GHz Intel Atom Z2560 processor isn't the fastest out there, the 2GB of RAM should help take some of the pressure off. There's also 1080p video recording for the camera, which, along with the high resolution screen, trumps the Samsung Galaxy Tab 3 10.1 (though this one's some 30% cheaper than the Memo Pad). The Memo Pad FHD10 also comes in some interesting color options like Royal Blue and Vivid Pink. Google's Nexus 10 offering by Samsung is now a year old, but has aged well thanks to its dual-core 1.7GHz Exynos 5250 chipset and excellent 2560 x 1600 pixel Super PLS TFT display. The resulting pixel density is just under 300 ppi. That and the 1080p video recording, Android 4.4 KitKat, and ample 9,000 mAh battery make it a very compelling value for its now reduced price. However, there is no microSD card slot, so we recommend you go for the 32GB version. This one would run you about the same price as the Memo Pad FHD10 (coupled with an extra 32GB card), so choosing either of them is really about choosing your priorities: having expandable and removable storage vs. a higher-res screen, a bigger battery and timely Android updates. Microsoft's Surface 2 tablet saw an October release this year alongside Windows 8.1 RT. While the 8.1 update did bring a few improvements, the RT version of Microsoft's mobile OS still retains its love-it-or-hate-it stigma. Nevertheless, the quad-core 1.7GHz Tegra 4 CPU, FullHD display, and solid construction with 2-stage kickstand make for quite a compelling offering, and the ample amount of storage is expandable via microSD. There's also the full MS Office suite that comes preinstalled, which is the sort of productivity tool you will have a hard time finding on competing platforms. Windows RT offers a fluid user experience but it's nether Windows Phone, nor regular Windows, so there is not that big of a choice of apps and also the only way you get those is via the Windows Store. The Windows RT platform is further made irrelevant by the influx of many compelling tablets, running the proper version of Windows on Intel's new Bay Trail architecture (you will know the by the chipset model named something like this Z3xxx). If you plan on getting one of the (rather expensive) keyboard covers, we recommend the Type cover, as the Touch cover offers no tactile feedback. Sony's Xperia Tablet Z is one of the most stylish tablet offerings you'll see at this or any other size with ultra-slim 6.9mm waistline. Under the hood there's a 1.5GHz Snapdragon processor with 2GB of RAM and Adreno 320 GPU, and Sony is already working on an Android 4.4 KitKat update. It was only last month that Sony announced their next gen tablet. Dubbed the Sony Xperia Z2 Tablet, it has a faster Snapdragon 801 chipset and an 8MP back camera with improved Exmor RS sensor. It also has an improved water resistance - this time it would gladly take a dip in the kiddie pool for up to 30 minutes. There is also the latest Android 4.4 KitKat on board. It's rated battery times are lower though, which doesn't bode well for its market chances. The battery life of the original model was not stellar. The Xperia Z2 Tablet is supposed to have its market launch in March. We guess, that would make the previous generation even more affordable. If you're big on typing, then Asus has you covered again with its latest Transformer Pad TF701T. Basically a MeMo Pad on steroids, the TF701T comes with an ultra-crisp 2560 x 1600 pixel screen, a hefty quad-core 1.9 GHz Tegra 4 processor, and 32GB of expandable storage. More importantly, the Transformer earns its moniker by being the only tablet that also comes with a keyboard dock as part of the retail package, making it a great deal, but that's not to say it comes cheap. The latest Samsung Galaxy Note 10.1 (2014 edition) brings an incredibly sharp 2560 x 1600 pixel display, 3GB of RAM, and quad-core Snapdragon 800 to the table. Samsung's great pressure-sensitive S-Pen offers something other tablets simply can't match. The pleasant leather-like textured plastic back from the Note 3 has also made its way to its elder sibling and it works great visually. Finally, if price is not a factor, then the Apple iPad Air brings an ultra-sharp display alongside Apple's proprietary A7 chipset. The iPad Air features a 4:3 aspect ratio, which is arguably the more user-friendly aspect for web browsing or reading and also offers more screen real estate for the same diagonal. Thanks to Apple's extensive app store, there's no shortage of functional and innovative apps and games. The recent release of Samsung's Pro range of tablets marks the first time when Samsung dares release tablets that are priced higher than the iPad range. And if it wasn't for the superior Apple App Store this time we would have argued their move is quite reasonable. The Samsung Galaxy Tab Pro 10.1 has a seriously high price tag but it's a spectacular piece of tech. It offers a beautiful screen that has higher resolution than the iPad Air, a micro SD slot, an 8MP camera, and a capable octa-core Exynos chipset. It not only comes with the latest Android OS v4.4 (KitKat), but Samsung has also baked in a spanking new tablet interface of their own, which truly elevates the tablet user experience to a whole new level (the split-screen multi-tasking view is well overdue on high-res tablets). If you really want to splurge you might as well pick up either of the two new Samsung 12.2 tablets. There is the Samsung Galaxy Tab Pro 12.2 and the Samsung Galaxy Note Pro 12.2, if you are after Samsung's exclusive pressure-sensitive stylus functionality. Other than that there is not that much difference between the two. They both have 12.2-inch screens with 2560 x 1600 pixel resolution, a minimum of 32GB of built-in storage plus a card slot, octa-core Exynos chipsets and 8MP cameras with 1080p video recording. Again, those come come with the latest Android OS v4.4 (KitKat) coupled with Samsung's home-baked goodies that bring a huge boost to productivity. The split-screen multi-tasking view is well overdue on high-res screen tablets and it's brilliantly implemented here, allowing to run up to four apps side by side plus even more in the form of floating windows.